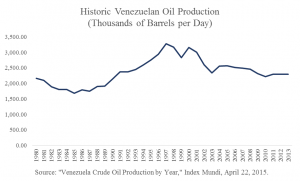 Venezuelan oil production has not risen substantially in almost two decades. Why? Simply put, because of the country’s involvement in the Organization of the Petroleum Exporting Countries (OPEC) and its incredible reliance on oil, which is estimated to be responsible for 96 percent of government revenue. This is not the byproduct of a lack of private interest in the country: Exploration and extraction companies such as Chevron already operate within Venezuela and the Bolivarian government even claims grievances against ExxonMobil for resource theft by its international waters with Guyana. This is not because the country is attempting to use its reserves more sustainably — Venezuela has the largest deposit of proven oil reserves, and owns over 17 percent of the world’s oil. The combined lack of productivity and revenue is due to OPEC quotas, which have become a thorn in President Maduro’s side. Apart from simply diversifying their economy and liberalizing the market, it is becoming increasingly urgent that Venezuela corresponds with the needs of its people rather than the whims of OPEC. The ailing nation should reduce these regulatory barriers such that its production more accurately reflects growth in global oil demand; it is after all one of the few oil-rich nations that has yet to do so.